Confession from the Tree of the Knowledge of Good and Evil | Lift Jesus' Cross! Posted on August 29, 2011	by Lift the Cross of Jesus! If you’ve been around me for long, you know that I talk about the Tree of Life a lot. 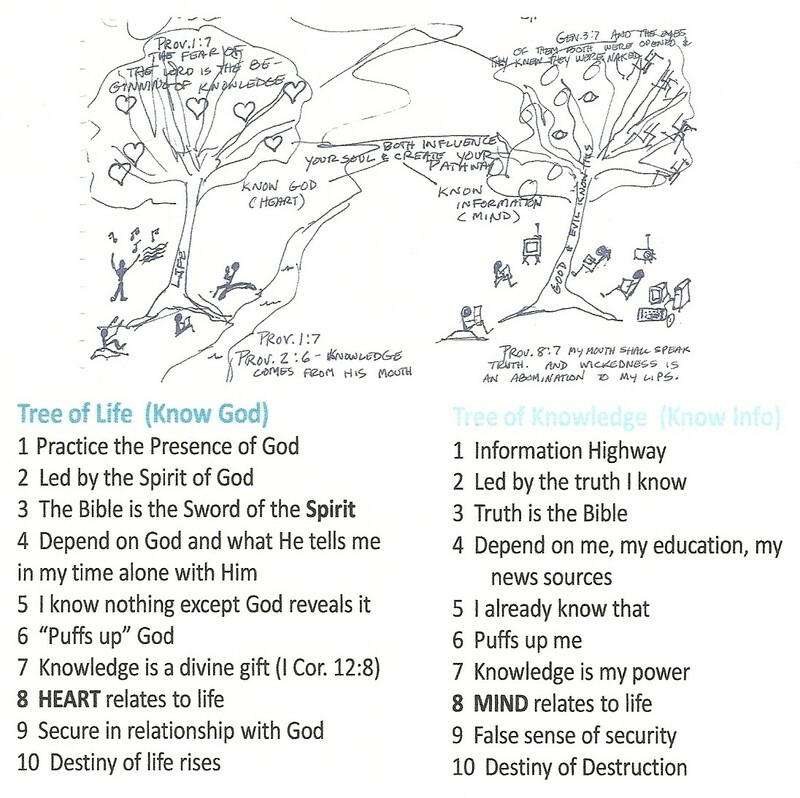 On the left is a simple picture of the Tree of Life and on the right a simple picture of the Tree of the Knowledge of Good and Evil. Notice that the people on the right are accumulating information. The people on the left are connecting with the source of all life, Jesus. Oftentimes we connect with God through just listening, quieting our souls. Other times we enter into fellowship with Him through praise, prayer, and the Word. Well, I have a confession. Yesterday, I slid away from the Tree of Life. You know that Hurricane Irene poem? Well, the Father didn’t tell me to post that. I did it on my own. Ugh. Last week I worked to market my new book (which finally came in last week– www.historymakerpublishing.com ) and I learned a lot about marketing! Well, that’s good. But what I knew in my head started taking charge of the direction for my day. SO, I wrote this snappy little poem and posted it. Please check out the teaching on the right. Instead of being led by the Spirit, I was led by the truth I know–I knew if I posted something titled “Hurricane Irene” that chances were pretty good that new people would do a google search for the hurricane stats and find my blog. Well, I reasoned, this is the cross, right? I want more people to KNOW (there’s that word again) about the cross. Boo. Not where you wanna be, Hope, I told myself later. I knew how to market and I operated on that KNOWLEDGE. I depended on what I knew. NOT where you wanna be, Hope. Yikes! I actually had this thought: Wow, that’s good writing. I’ll bet somebody’s going to tell me how much they like that. Somebody WAKE ME UP!! Pride STINKS. I left the Tree of Life and found myself accepting puffed up thoughts about Hope and how talented she was. And so He forgives me. And I confess to you that I veered off track. I apologize to you. I don’t want to give you information or snappy little poems unless God is initiating poems and information. My desire in coming to this blog is to move directly from the Tree of LIFE to the keyboard and share from His heart. Sending His mighty love to each one of you! This entry was posted in The Cross and the Christian, Uncategorized and tagged Tree of Life; Confession; Tree of the Knowledge of Good and Evil; Tree of Knowledge; Confess; sin; fellowship; know; knowledge. Bookmark the permalink. Thank you so much for your humility in sharing as you did today – I so appreciate what you said – it brings life to me and also has taught me something huge, so thank you, thank you Hope, and I am praying the Holy Spirit will continue to remind me of this in my own walk with Him. God bless you and your family and your ministry, love from Gill. Bless you my friend! I can only hope that transparency will take me to a deep humility of heart. I am so glad that God used this to benefit you as well. He’s multi-tasking for the good even using our mistakes!! Incredible God! And much love back to you!